This article is about the prefecture. For the ward in the city of Kobe, see Hyōgo-ku, Kobe. 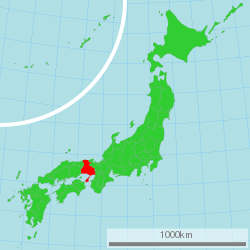 Hyōgo Prefecture (兵庫県, Hyōgo-ken) is a prefecture of Japan located in the Kansai region on Honshu island. The capital of Hyogo is Kobe. Present-day Hyōgo Prefecture includes the former provinces of Harima, Tajima, Awaji, and parts of Tanba and Settsu. Hyōgo has coastlines on two seas: to the north, the Sea of Japan, to the south, the Seto Inland Sea. On Awaji Island, Hyōgo borders the Pacific Ocean coastline in the Kii Channel. The northern portion is sparsely populated, except for the city of Toyooka, and the central highlands are only populated by tiny villages. Most of Hyōgo's population lives on the southern coast, which is part of the Osaka-Kobe-Kyoto metropolitan area. Awaji is an island that separates the Inland Sea and Osaka Bay, lying between Honshu and Shikoku. Summertime weather throughout Hyōgo is hot and humid. As for winter conditions in Hyōgo, the north of Hyōgo tends to receive abundant snow, whilst the south receives only the occasional flurry. As of March 31, 2008, 20% of the total land area of the prefecture was designated as Natural Parks, namely the Sanin Kaigan and Setonaikai National Parks; Hyōnosen-Ushiroyama-Nagisan Quasi-National Park; and Asago Gunzan, Harima Chūbu Kyūryō, Inagawa Keikoku, Izushi-Itoi, Kasagatayama-Sengamine, Kiyomizu-Tōjōko-Tachikui, Onzui-Chikusa, Seiban Kyūryō, Seppiko-Mineyama, Tajima Sangaku, and Taki Renzan Prefectural Natural Parks. Kobe is where the Hyogo Prefectural Government sits. The city of Akō and the only town in Akō District (Kamigōri), were scheduled to merge and the city would still retain the name Akō. Akō District would be defunct if the merger was successful. However, the merger hasn't taken place. As in all prefectures nationwide, agriculture, forestry, and fisheries play a big role in the economy of Hyogo Prefecture. Hyōgo Prefecture also has an IT industry, many heavy industries, metal and medical, Kobe Port being one of the largest ports in Japan. Kobe Port also hosts one of the world's fastest supercomputers, and Hyogo Prefecture passed laws to keep Kobe Port free of nuclear weapons (a nuclear-free zone) since the year 1975. Hyōgo is a part of the Hanshin Industrial Region. There are two research institutes of Riken, natural sciences research institute in Japan, in Kobe and Harima. "SPring-8", a synchrotron radiation facility, is in Harima. Hyōgo Prefectural Museum of Art in Nada Ward, Kobe. Hyōgo Prefectural Museum of Art in Kobe. There are 163 public and 52 private high schools within Hyogo prefecture. Of the public high schools, some are administered by the Hyogo prefectural government, whilst the others are administered by local municipalities. The sports teams listed below are based in Hyōgo. The north of Hyogo Prefecture has sightseeing spots such as Kinosaki Onsen, Izushi, and Yumura Onsen. The matsuba crab and Tajima beef are both national delicacies. 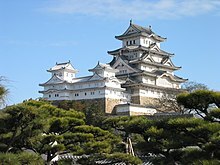 Hyogo entered a sister state relationship with Washington state in the United States on October 22, 1963, the first such arrangement between Japan and the United States. In 1981, a sister state agreement was drawn up between Hyogo and the state of Western Australia in Australia. To commemorate the 10th anniversary of this agreement in 1992, the Hyogo Prefectural Government Cultural Centre was established in Perth. ^ Nussbaum, Louis-Frédéric. (2005). "Hyōgo prefecture" in Japan Encyclopedia, pp. 363-365, p. 363, at Google Books; "Kansai" in Japan Encyclopedia, p. 477, p. 477, at Google Books. ^ Nussbaum, "Kobe" in Japan Encyclopedia, p. 537, p. 537, at Google Books. ^ "General overview of area figures for Natural Parks by prefecture" (PDF). Ministry of the Environment. Archived (PDF) from the original on 21 April 2012. Retrieved 4 February 2012. ^ "ⅩⅡ Income of Agriculture, Forestry and Fisheries" (PDF). Ministry of Agriculture, Forestry and Fisheries. Archived (PDF) from the original on 2015-09-19. Retrieved 2017-10-02. ^ "RIKEN Advanced Institute for Computational Science". Archived from the original on 2017-09-26. Retrieved 2017-10-02. ^ "JAL Guide to Japan - Matsuba Crab". Archived from the original on 2015-04-05. ^ Camden, Jim (August 20, 2013). "Washington, Japan celebrate 50 years". Spokesman-Review. Archived from the original on March 11, 2018. Retrieved March 11, 2018. ^ "Celebrating 50 years with Hyogo, Japan". Washington State Library. August 19, 2013. Archived from the original on March 11, 2018. Retrieved March 11, 2018. ^ "Sister Cities - City of Perth". Archived from the original on 2015-05-30. Wikimedia Commons has media related to Hyogo prefecture. Wikivoyage has a travel guide for Hyogo.